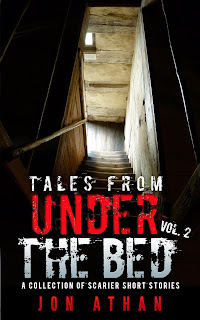 Jon Athan: Pre-order Tales From Under The Bed Vol. 2 now! + Check out The Stories! 1. Don't Go Down The Stairs! 5. Do You Like Seafood? It's a fairly diverse set of scary stories, I think it's well worth your time. I definitely appreciate your readership, if you decide to purchase or borrow. The book releases on November 19th, 2014, I hope to see you then! Pre-order for $2.99 on Amazon.com!